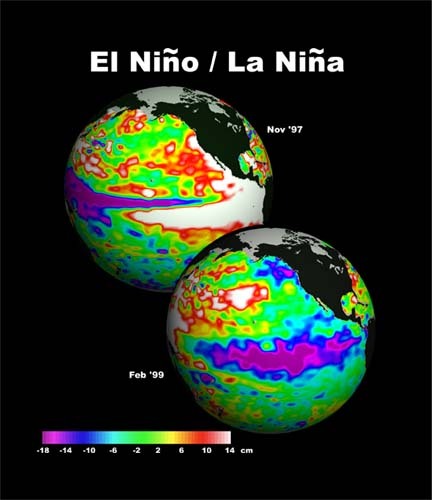 El Niño/La Niña is a naturally occurring 2-7 year cycle of the ocean-atmosphere system in the Tropical Pacific having important consequences for weather and climate around the globe. El Niño (Spanish for the little boy or the Christ Child) is a disruption of the ocean atmosphere system in the tropical Pacific. El Nino, an abnormal warming of surface ocean waters in the eastern tropical Pacific, is one part of what's called the Southern Oscillation. The Southern Oscillation is the see-saw pattern of reversing surface air pressure between the eastern and western tropical Pacific; when the surface pressure is high in the eastern tropical Pacific it is low in the western tropical Pacific, and vice-versa. Because the ocean warming and pressure reversals are, for the most part, simultaneous, scientists call this phenomenon the El Nino/Southern Oscillation or ENSO for short. Normally trade winds move westward carrying warm water to Australia. Cooler water can upwell along the South American coast. This cool water carries nutrients that support large fish populations in the region. Every three to seven years, these trade winds die and the warm water that was once pushed westward is allowed to shift back towards South America. South American fisherman have given this phenomenon the name El Niño, which is Spanish for "The Christ Child," because it comes about the time of the celebration of the birth of the Christ Child-Christmas. El Niño disrupts the ocean-atmosphere system in the tropical Pacific having important consequences for weather around the globe. Among these consequences are increased rainfall across the southern tier of the US and in Peru, which has caused destructive flooding, and drought in the West Pacific, sometimes associated with devastating brush fires in Australia. La Niña (Spanish for the little girl) is essentially the opposite of El Nino The ocean becomes much cooler than normal. Although, La Niña is not as well understood as El Niño, it is thought to occur due to an increase in the strength of the trade winds This increases the amount of cooler water that flows toward the west coast of South American and reduces water temperatures. Global climate La Niña impacts tend to be opposite those of El Niño impacts. In the tropics, ocean temperature variations in La Niña tend to be opposite those of El Niño. 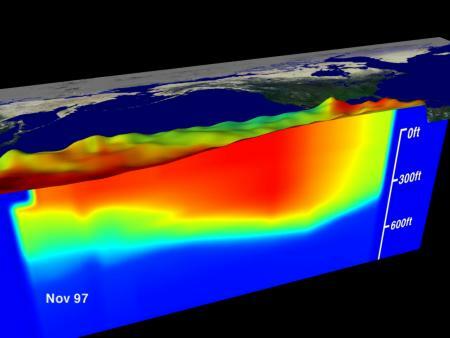 The image shows what happens when a very strong El Nino strikes surface waters in the Central equatorial Pacific Ocean. The sequence shows warm water anomalies (red) develop in the Central Pacific Ocean. Winds that normally blow in a westerly direction weaken allowing the easterly winds to push the warm water up against the South American Coast. This image shows colder than normal water (blue) anomalies in the central equatorial Pacific associated with La Nina. 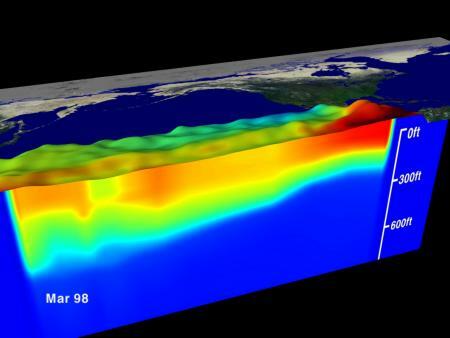 Stronger than normal trade winds bring cold water up to the surface of the ocean. 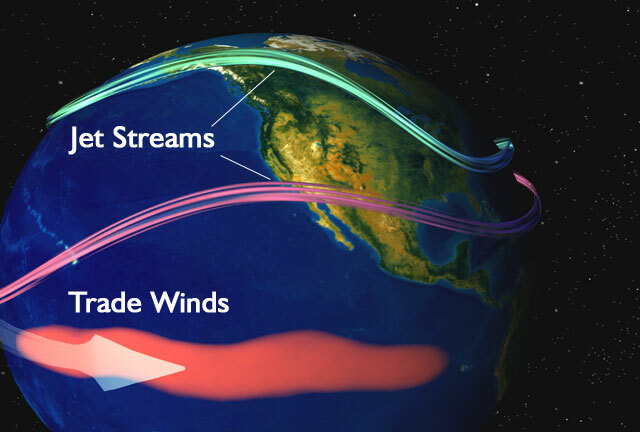 This image shows the current El Nino's split personality. Warm waters develop in the central Pacific Ocean. In this case, the warm water anomalies tend to stay in place in the central Pacific. The images show sea surface topography from NASA's TOPEX satellite, sea surface temperature's from NOAA's AVHRR satellite sensor and sea temperature below the surface as measured by NOAA's network of TAO moored buoys. 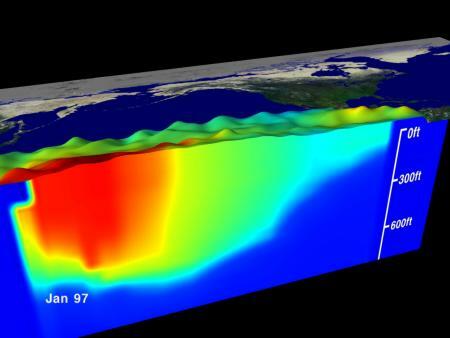 The three dimensional relief map shows a sea level rise along the Equator in the eastern Pacific Ocean of up to 34 centimeters with the red colors indicating an associated change in sea surface temperature of up to 5.4 degrees Celsius. The sea temperature below the surface illustrates how the thermocline (the boundary between warm and cold sea water at 20 degrees Celcius) is flattened out by El Niño. These images are beneath Sea Views of sea surface height (represented by the bumps) and sea temperature (represented by the color). Red is 30 degrees C and blue is 8 degrees C. The thermocline is the border between the dark blue at the bottom and the cyan. The thermocline exists at 20 degrees C. Data from 1/1/97 to 3/10/98. General: During winter El Niño episodes (top map) feature a strong jet stream and storm track across the southern part of the United States, and less storminess and milder-than-average conditions across the North. La Niña episodes (bottom map) feature a very wave-like jet stream flow over the United States and Canada, with colder and stormier than average conditions across the North, and warmer and less stormy conditions across the South. Detailed El Nino: El Niño episodes are associated with four prominent changes in the wintertime atmospheric flow across the eastern North Pacific and North America. 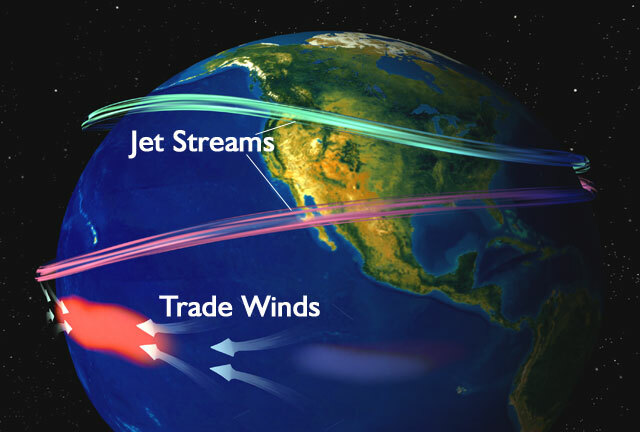 The first is an eastward extension and equatorward shift of the East Asian jet stream from the International Date Line to the southwestern United States. 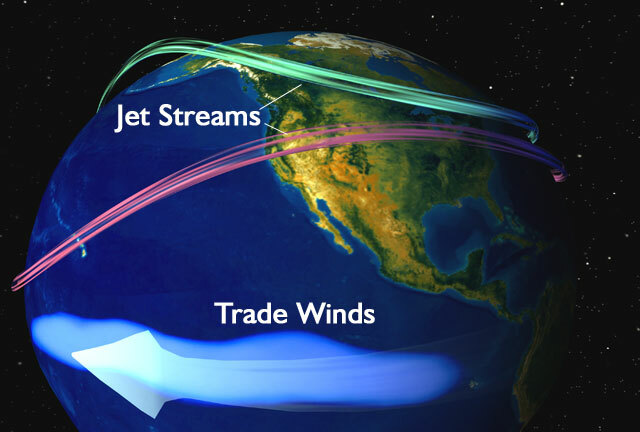 The second is a more west-to-east flow of jet stream winds than normal across the United States. The third is a southward shift of the storm track from the northern to the southern part of the United States. The fourth is a southward and eastward shift of the main region of cyclone formation to just west of California. This shift results in an exceptionally stormy winter and increased precipitation across California and the southern U.S, and less stormy conditions across the northern part of the country. Also, there is an enhanced flow of marine air into western North America, along with a reduced northerly flow of cold air from Canada to the United States. These conditions result in a milder than normal winter across the northern states and western Canada. During La Niña episodes rainfall is enhanced across the western equatorial Pacific, Indonesia and the Philippines and is nearly absent across the eastern equatorial Pacific. Elsewhere, wetter than normal conditions tend to be observed during December-February (DJF) over northern South America and southern Africa, and during June-August (JJA) over southeastern Australia. Drier than normal conditions are generally observed along coastal Ecuador, northwestern Peru and equatorial eastern Africa during DJF, and over southern Brazil and central Argentina during JJA. 3) warmer than normal conditions during December-February along the Gulf coast of the United States.